I’m having a very busy day today, so I’m just going to post a picture that has always made me curious and see if anyone has anything to say about it. First, I’m not completely sure where the photographer was standing. Was it a spot that’s now parking lot? Second, when was it taken? At a quick glance it doesn’t seem that old, but once I started looking closely it looks quite different from today. That looks like it was shot from what is now the for-pay parking lot behind the Shepherd School building. Unless it is so far over, laterally, that it is where the tennis courts now are. I like that in the second photo the newer brick is on the _inside_. That doesn’t beg the question _at all_. 1. Judging from the stadium (e.g. no “R” room) and the presence of a concrete manhole cover in the left center of the photograph I’d say this area was the path of the drainage ditch. Today it’s in a parking lot or the tennis stadium? 2. The bonus photograph was the window in my room at Hanszen. 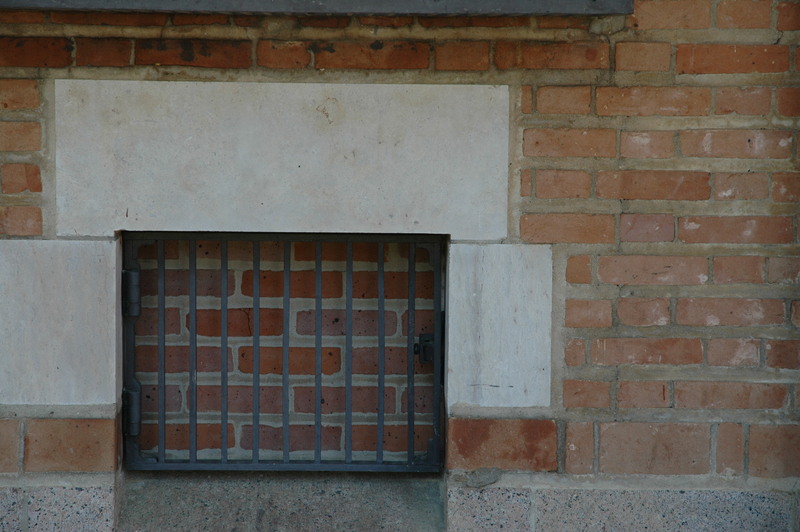 The steel bars weren’t enough to keep me in so the University bricked over the window! You were quite a desperado, I’m sure! If you look at the December 1953 imagery on Google Earth, you will see a dirt road that seems to sort of “delta” as it reaches the parking lot. That makes me think the pic is approximately where Aiice Pratt Brown Hall is now, maybe about 1955? The bonus — maybe a basement space in Physics or Chem Lec where a window was deleted in renovation? I won’t be on campus again until tomorrow evening to check, but I _believe_ that the angle of the view from APB Hall towards the stadium would not afford sufficient view “inside” to create that photo. I believe the location of the shot has to be further South. Probably not very much South, but from APB Hall the “gap” at the end of the stadium would be to “flat on”. I _think_. Looks like about from where the back end of Continuing Studies is today. The houses in the background appear to be the back side of houses on Chaucer. The land on the west side of Greenbriar was vacant in the 50’s (at the University Blvd end at least). That would be “Alice” Pratt Brown Hall. Aiiieee! Yes, similar to basement windows in Lovett Hall. Here’s a suggestion for a mystery pic. Far south basement window in Lovett Hall, quad side, has something that’s been sitting on the window frame that looks like a marshmallow. It, however has not changed appearance since I noticed + or – 2 weeks ago and there are no insects interested in it…? I think this was taken from the area that is now occupied by the Youngkin Center. The manhole appears to be visible on Google Earth just north of the existing palm trees. We have learned from other photos that campus manholes do not go away nor do they shift positions. The angle is not right for either the Alice Pratt Brown Hall area or the Martel Center area. I think you are in the right area. 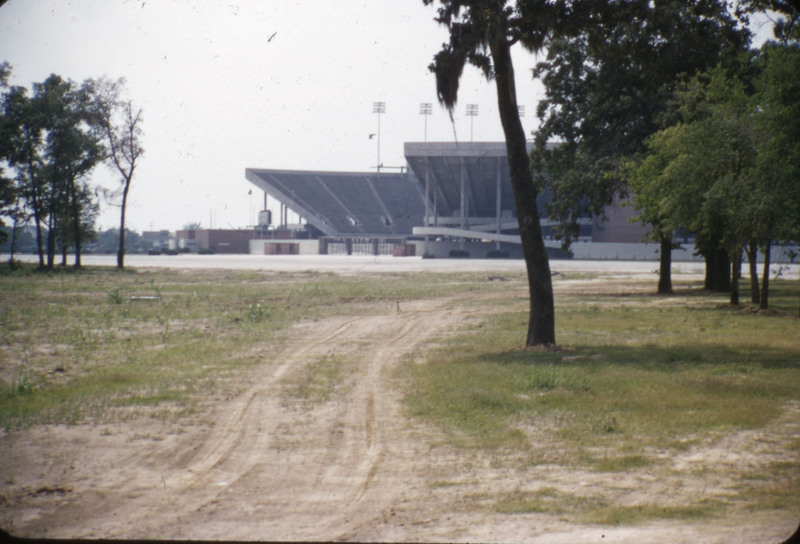 Martel Center would expose the short side of the east upper stands facing University Blvd. I missed that in suggesting that location.